Hope you're enjoying your Thanksgiving weekend. We've had a wonderful, quiet and blessed holiday. A tea for friends December, 2011. Pink Transferware, Red Toile runner and Christmas candles in a pair of hurricanes have a festive, merry look. A Christmas table in the living room. December, 2012. 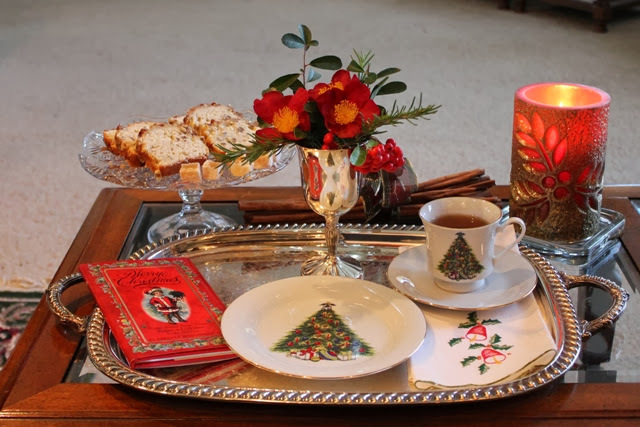 The beautiful Red Cardinals, red runner, and Christmas dishes with the meaningful words. Twelve Days of Christmas. I loved the English crackers for favors. A Christmas Tea for one. Tea Time under the White Feather Tree. One of my favorite angel ornaments. Please join me as I start my 25 days of Christmas. I would love to spread as much Christmas Joy for the next 25 days as I can muster. So many festive tables capes. Love them all!